This lumbering load of gravel can be found in or near rock quarries. Often slow, but very strong and hard as a rock. Will often throw rocks at opponents or simply crush them. This was an experiment figure. I took a handful of small rock fragments and pressed them into green stuff to make the body and added the features, then I made the mold to see what would happen. I liked it and decided to put it into production. 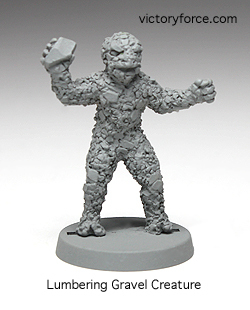 You can find the Lumbering Gravel Creature in the Creatures Section of the Victory Store. This entry was posted in Spotlight and tagged 28mm, creatures, miniatures. Bookmark the permalink.